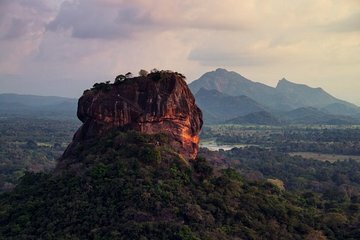 Explore two of Sri Lanka’s UNESCO-listed highlights on a privately guided day trip to Dambulla and the Sigiriya Rock from Colombo. View Sri Lanka’s countryside and villages as you journey to the atmospheric Dambulla Cave Temple, a cliffside cave complex packed with Buddha images and frescoes. Explore the caverns and after lunch continue to Sigiriya, a spectacular, ruined 5th-century royal fortress atop a gigantic rock outcrop. Climb the stairs up, passing the rock murals on the way, and marvel at the ruins and 360-degree views from the top.